This figure is machine made and appears as it would have if it the toy series had not been cancelled. 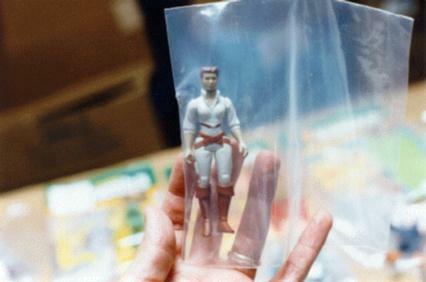 It is made of plastic and painted like any other production figure. The weapon isn't shown here, but it would have been a Stormtrooper blaster. While the figure isn't very exciting to look at, it is a good rendition of the character as shown on the original artwork for the proposed card.